The 6 vertexed ring does not conform to the shape of a perfect hexagon. The conformation of a flat 2D planar hexagon has considerable angle strain due to the fact that its bonds are not 109.5 degrees; the torsional strain would also be considerable due to all eclipsed bonds. Therefore, to reduce torsional strain, cyclohexane adopts a three-dimensional structure known as the chair conformation. The new conformation puts the carbons at an angle of 109.5Â°. Half of the hydrogens are in the plane of the ring (equatorial) while the other half are perpendicular to the plane (axial). This conformation allows for the most stable structure of cyclohexane. Another conformation of cyclohexane exists, known as boat conformation, but it interconverts to the slightly more stable chair formation. If cyclohexane is mono-substituted with a large substituent, then the substituent will most likely be found attached in an equatorial position, as this is the slightly more stable conformation. 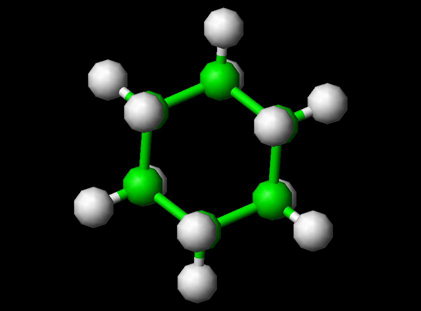 A cyclohexane molecule in chairconformation. Hydrogen atoms in axial positions are shown in red, while those in equatorial positions are in blue. The specific arrangement of functional groups in cyclohexane derivatives, and indeed in most cycloalkane molecules, is extremely important in chemical reactions, especially reactions involving nucleophiles. Substituents on the ring must be in the axial formation to react with other molecules. For example, the reaction of bromocyclohexane and a common nucleophile, a hydroxide anion , would result in cyclohexene. Commercially most of cyclohexane produced is converted into cyclohexanone-cyclohexanol mixture by catalytic oxidation. KA oil is then used as a raw material for adipic acid and caprolactam. Practically, if the cyclohexanol content of KA oil is higher than cyclohexanone, it is more likely(economical) to be converted into adipic acid, and the reverse case, caprolactam production is more likely. Such ratio in KA oil can be controlled by selecting suitable oxidation catalyts. Some of cyclohexane is used as an organic solvent. 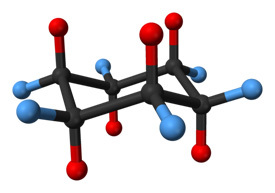 Although much is already known about this cyclic hydrocarbon, research is still being done on cyclohexane and benzene mixtures and solid phase cyclohexane to determine hydrogen yields of the mix when irradiated at 195°C. In 1894 Baeyer synthesized cyclohexane starting with a Dieckmann condensation of pimelic acid followed by multiple reductions. and in the same year E. Haworth and W.H. Perkin Jr. (1860 - 1929) did the same in a Wurtz reaction of 1,6-dibromohexane.Surprisingly their cyclohexanes boiled higher by 10Â°C than either hexahydrobenzene or hexanaphtene but this riddle was solved in 1895 by Markovnikov, N.M. Kishner and Nikolay Zelinsky when they re-diagnosed hexahydrobenzene and hexanaphtene as methylcyclopentane, the result of an unexpected rearrangement reaction.